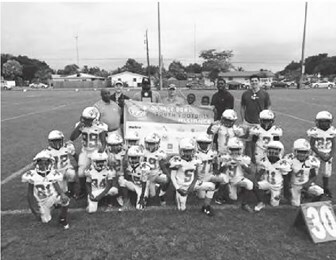 MIAMI LAKES, Fla. – The Orange Bowl Youth Football Alliance (OBYFA) recognizes select youth football parks across South Florida each Saturday during the fall as part of its continuous community engagement and support. Now in its twentieth season, this week the OBYFA will visit four parks that are members of the Miami Xtreme Youth Football League; one in Miami-Dade County and three in Broward. At each stop on the tour, Orange Bowl Committee members, ambassadors and staff present a commemorative plaque and financial contribution for park improvements. Attendees will also receive promotional items and discounts from official Orange Bowl YFA sponsors. Since the start of the program in 1999, the Orange Bowl has invested more than $7 million in South Florida Youth Sports Programs. The OBYFA benefits approximately 13,000 youth football players and cheerleaders reaching from Lake Okeechobee to Key West. The Park of the Week program is an opportunity to impact communities through the inclusion of sports. Orange Bowl members, staff and volunteers are involved with this program to make a difference in the lives of South Florida families. In addition to the OBYFA, the Orange Bowl directly supports locally based festivals and events that provide participatory opportunities to youth from all over the world. Youth sports is one of the four pillars of Orange Bowl Community Outreach, which also includes fundraising and community events, academic programs and scholarships, and legacy gifts. For 85 years, the Orange Bowl has been one of South Florida’s leading civic organizations, promoting championship sporting events, related premier entertainment and other yearround activities to inspire youth, engage our community and enhance the South Florida economy. This year’s Orange Bowl Youth Football Alliance is presented by MetroPCS and supported by associate sponsors American Airlines, CiCi’s Pizza, Clutch Insurance, Comcast, Dave & Buster’s, Marathon Petroleum Company, Miami Orthopedics & Sports Medicine Institute, Nike, Toyota, Wells Fargo and Xenith continue to positively impact the South Florida community. For more information about the Orange Bowl Committee and the Orange Bowl Youth Football Alliance presented by MetroPCS please visit www.orangebowl.org.